← Magazine Naming Contest for a Free Kindle Fire!!! Available at Amazon April 15, 2014!!! Can Bronte keep it together, regain her first love, or will he reject her forever? What will happen when she meets Bayer at the mirrored lake? Join Bronte as she begins a journey of self-discovery, learning the truth, which reveals that she is the one who is different from those around her. Follow her story as she learns what her family has worked so hard to conceal from her, and is now set to turn her world upside-down. Did you ever have an itch you couldn’t scratch, a feeling that you’re supposed to be doing something else, something bigger with your life? Something that would touch the souls of the rest of mankind and justify your place amongst our fellow men, but you just couldn’t put your finger on what? Well I spent the best part of 40 years looking for the answer and low and behold, I finished back where I started, with writing. I sometimes question why I didn’t just turn in the opposite direction, I would have got there straight away, but my path led me away from writing when I was just a teenager, because I lacked the confidence to pursue the dream. Reminiscing one day, the thought occurred to me that if I had found writing back then, I wouldn’t have taken the journeys that led me to write The Hidden Saga. My name is Serina Hartwell. I live with my better-half of 18 years, Macius, and I’m the mother of two wonderful children, who grew up when I blinked. I always write with my writing companion, my cat Tilly, and I come from an average size town in West Yorkshire, England. The same place where the Bronte sisters were born and I am from the village in the mill town I write about. Growing up in an industrial town, and coming from a working class background, I was surrounded by the mills, which were once the life blood of the community. Decrepit and falling into disrepair, they shadowed the place where I lived, serving as a reminder that our town once thrived. I watched as one by one, the mills went out of business and closed, serving to inspire my story, while changing the landscape around me. My mother worked in the mills when I was a child. I recall every night, my father taking my brother and I to the mill to collect her and walk her home over the lonely beck-side. These trips along the shortcut are embedded throughout Hidden, as my childish imagination finally materialised on the page. It was only recently that I found my way back to writing, when I suddenly found out that I was seriously ill. It’s funny how life has a way of bringing you full circle and offering you sharp reminders that time is slipping through your fingers. One moment I was fine and the next I was in a very bad place. Today you look upon the writing of one of the luckiest people on the planet, as I recovered and moved forward. Luck I intend to build upon. With doors closing all around me and my timely reminder, my life reached a turning point, and I knew I had to find the thing I was supposed to be doing and get on with it. That’s when I really started looking. In August 2010, I had the most intense urge to write. It came from nowhere, so I did the only thing I could, I borrowed my daughter’s laptop. I didn’t even know at the time if I could write. The last creative thing I wrote was at school. I didn’t know if I could connect with the page, let alone complete a book, but one thing is for sure, I haven’t stopped writing since, nor do I intend to. So, allow me to introduce you to my work. May I begin by introducing Bronte, in The Hidden Saga? 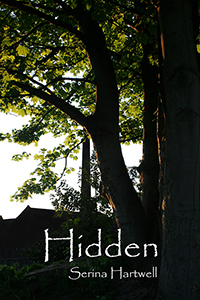 I hope you enjoy Hidden and the many more to come. Thank you for your help Elissa Daye.